The innovation in communicating self assurance systems. 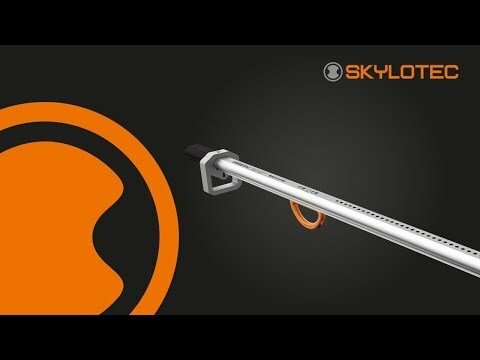 SKYLOTEC has with the EASY ESB – Electronic Self Belay - once again proved that innovation and technology are the constant companions of SKYLOTEC. The EASY is the first safety system in which the carabiner hooks communicate without contact with each other and with the safety rope! The first prototype was presented by the development team on the ERCA (European Rope Course Association) Congress on 22.01.2013 in Hennef, Germany. A major feature is that all wearing parts such as webbing can be replaced by the rope course owner. No bowden cable, no twisting and no heavy system over 2 kg – simply EASY. • Accidental detachment is not possible. • Attaching to strucutres not intended is also prevented. • The carabiner can be customized for specific courses which than will be unlocked. • Misuses are stored. The analysis allows a targeted improvement of the park. • The supervisory staff can always unlock the carabiner for rescue. • Maximum security and maximum freedom for self-protection. • The fingers are kept completely outside the closure area. The risk of injury is significantly reduced. • Easy to retrofit the system in existing parks. • Parallel operation with other security systems is possible. • Fewer supervisory personnel is needed. • The wear plate at the top of the carabiner can be replaced by the course operator. • The Skysling (sling) between carabiners is replaceable.